A while back I was working with a friend’s startup, building a web app that helps small businesses connect with their customers without having to pay for dedicated customer service teams. Still in the proof-of-concept stage, the developers had been wondering whether to introduce a handful of premium services to their product for a some time, but didn’t know how they should decide whether or not to take that leap. I tackled this problem by combining two activities I’d recently learned about, one from Gamestorming, which had just left the presses, and one my friends Barbara Holmes and Jeanne Turner at ISITE Design had been polishing and presenting at various meetings and IxDA events: user journeys. Considering each step your users will take toward a desired outcome—from awareness of the product or service to becoming a loyal customer—is instrumental in design a pleasant experience, as Barb points out in her article, Mapping the Customer Journey. The customer (or user) journey is a great way to visualize real-life scenarios that could potentially stand in the way between winning and losing a potential user. But this wasn’t just about designing a great experience. It was about determining whether we should even start building a premium tier to validate a paid service. So I turned to Gamestorming, and found the Pre-Mortem game, a clever twist on the post-mortem summaries we’re all used to seeing at the end of a project. Pre-Mortem is a simple, straightforward activity meant to identify potential problems before they happen, and start thinking about how they can be avoided. 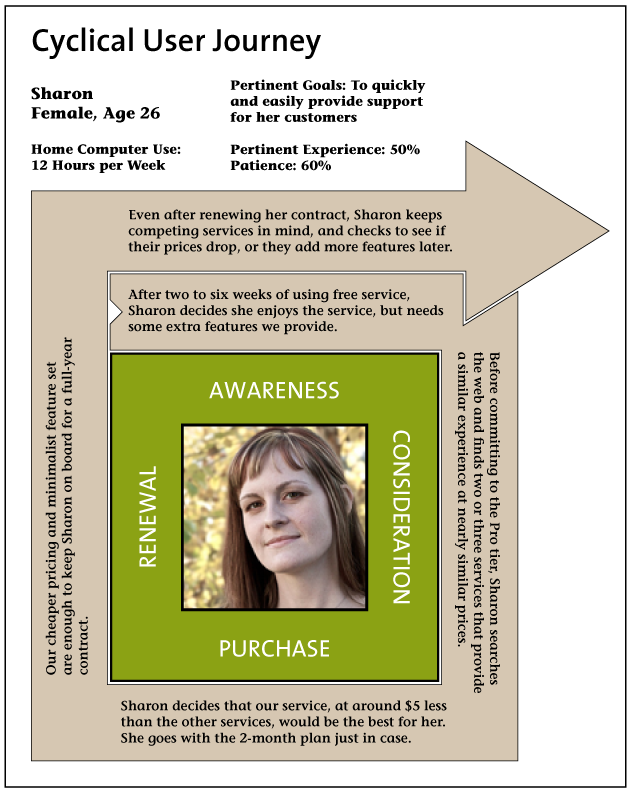 I decide to combine the concept with the user journey, and came up with something I’m actually pretty proud of. 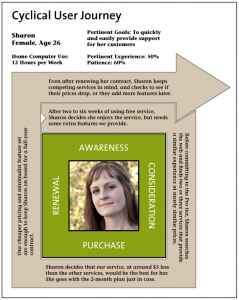 We decided to walk through the four phases of the user journey we’d identified, Awareness, Consideration, Purchase and Renewal, and came up with reasons throughout our personas’ journeys that might prevent them from becoming happy, loyal customers. We wrote short user stories to illustrate our customers’ desires and concerns along the way. Why cyclical? Since this would be a recurring cost to our customer, we would need to make sure we’re addressing her needs even after she decides to start paying for the service. So after the Renewal phase, we revisit Awareness, considering not only new features we’d be implementing, but a shifting roster of competitors as well. You’re never finished selling to your users, even after they’ve paid. 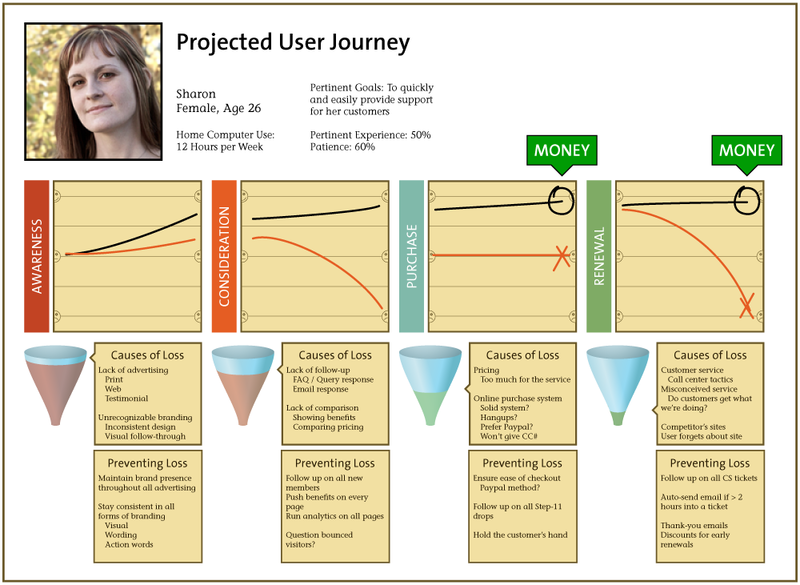 After laying out the phases of the journey, we came up with reasons why the user would abandon the product at any time. Each cause for lost customers was countered with possible actions we could take to keep them around. While the cyclical journey implies all four phases cycle endlessly, with this diagram we treated the Renewal phase as the point where recurring payments come in, abandoning the cyclical approach for a step-by-step analysis of each phase. A quick illustration at each phase shows the path of a happy customer, who decides to stick with the product, and that of a customer who decides to leave before the next phase starts. Every destination has its story, and pinning down the stories that lead to abandonment is the first step in discussing how to better serve your users. After determining how much work it would take to keep customers around, the team decided not to go through with this feature set, at least not for now. The service is still young, and while it seemed like an attractive option to have a premium tier with lots of extra features, this exercise convinced us that it wouldn’t be worth the initial investment. While there’s a chance we could have been the next big thing with this premium tier, I like to think I saved the company a lot of time and money which might have other wise been wasted on this effort. We’re still on the lookout for a feature set that will be worth the effort and might pay off in the long run, but it’s good to know that we haven’t sunk a bunch of time and money into one with such a low chance of success. Now that I’m running my own startup, Revisu, it’s important to me and my co-founder that we see as far as we can down the journey our users will take in becoming loyal customers, identify potential roadblocks, and deal with them before anyone actually reaches them. Hopefully, if we smooth that road out ahead of time, we’ll have much happier customers in the long run.